If you’re going to put a bottle of wine in a time capsule, maybe don’t bother with a cheap rosé. Yesterday afternoon, curious onlookers gathered at the Napa County Courthouse in California to glimpse the contents of a time capsule from 1979. And they learned that the time-capsulers of the 1970s included a bottle of the region’s favorite adult beverage. The sad part? You probably wouldn’t want to drink it. Anyone up for vinegar wine? The time capsule may have remained hidden for over a century, if it wasn’t for last summer’s earthquake. On August 24, 2014 Napa Valley was rocked with a 6.0 quake that left one person dead and over 200 injured. It was the strongest earthquake felt in the Bay Area in almost 25 years, and it damaged a number of buildings. Among them, the Courthouse, which was built in 1878. Construction crews were tasked with bringing the building up to code and recently discovered the time capsule hidden inside a staircase banister. Apparently it had been hidden by staff in an unofficial ceremony in September of 1979. Inside, they found some time capsule staples like letters and newspapers clippings, along with a few surprises. Like some wine. And bullets. I chatted with John Thill at the Napa County Library who filled me in on the discovery. 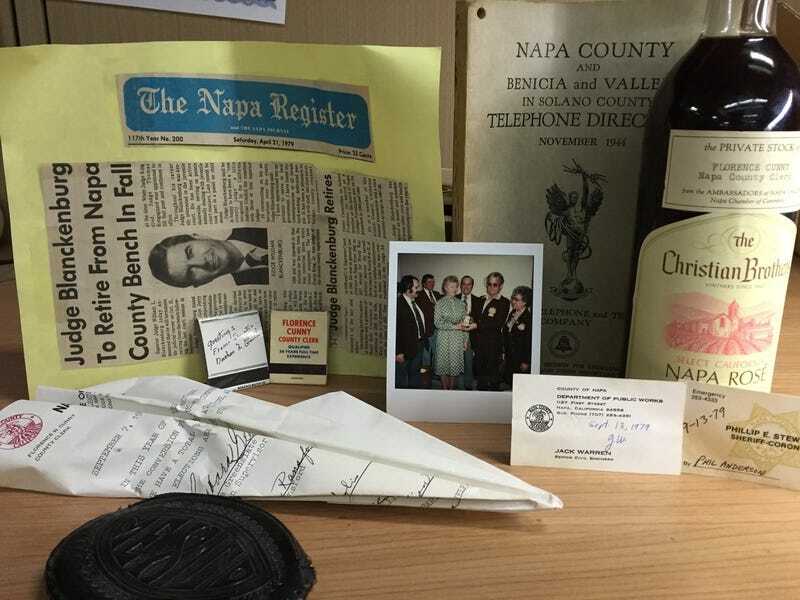 “It wasn’t one of those steel box affairs, but rather an assortment of ephemera from the courts during that period; business cards, newspaper clippings, matchbooks, two live rounds of ammunition, and a bottle of rosé,” Thill told me over email. Two live rounds? Did they think we wouldn’t have bullets in the future? And if so, what good is two bullets? “My guess is the ammunition came from one or more of the bailiffs working at the courthouse, I’m not sure what their motivation was,” Thill said. Construction on the courthouse will likely take another two years before it can be used again. But in the meantime, you’ll be able to see the contents of the time capsule in the Napa Library’s display cases. Some letters from the time capsule appear below, courtesy of John Thill.